That's the second of two mailboxes that aren't (yet) permanent. Last week's box was on a stack of blocks. 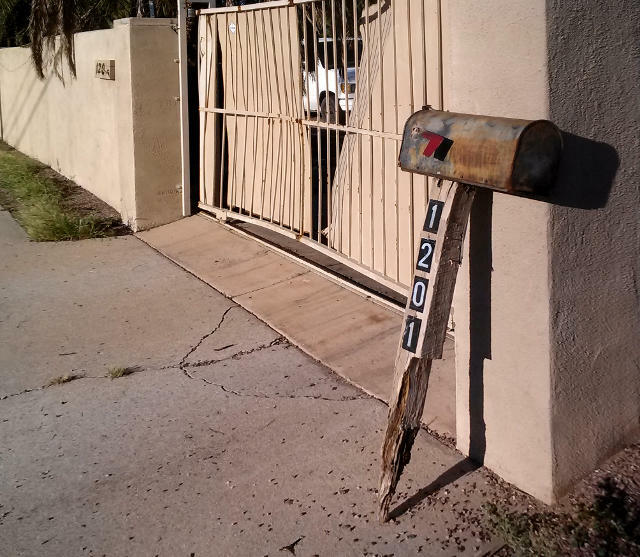 This week's rusted black mailbox is standing on the spike at the bottom of its pole, next to a gate, leaning on the wall. The gate also looks like it's seen better times. (And the house number on the other side of the gate is missing some numerals.) Hmmm: I wonder what happened here? I spotted this scene, just south of Reid Park, September 24th.